On Tuesday May 15th, 2018, over 140 Western staff and student volunteers participated in the annual Campus Clean-up. Volunteers met the Sustainability at Western team in the 3M Courtyard at three different time slots during the day despite the rainy weather. Adam, an ergonomist from Western, started the day off by taking participants through a warm up and stretch to ensure that everyone was ready to safely clean up. 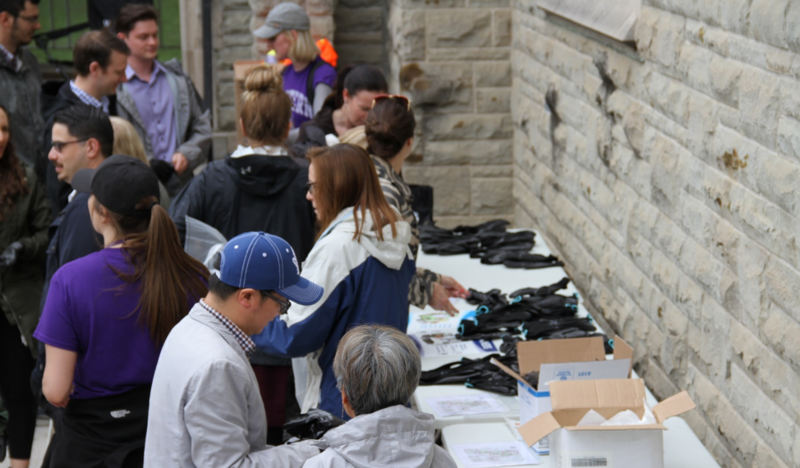 The Sustainability Team provided participants with gloves to wear as well as bags to place garbage and recycling into. Participants were also invited to join us for a BBQ lunch. There were many familiar faces in attendance as well as several individuals who were participating for the first time. The Sustainability Team was encouraged by the conversations we were able to have with participants throughout the day to discuss ways that we can work to keep the Western Campus clean and waste-free. Following the clean-up, an audit of the waste collected was completed and totaled to show us how much trash and how much recycling we were able to collect. For some perspective, this means that in 3 hours, volunteers helped to collect waste that weighs roughly the same as 18 adult Koala bears. Some of the most unique items collected included a wrench, a very waterlogged pillow, and a manhole cover found on the hill behind Alumni Hall. Thank you again for your time and effort, you made a very positive impact on our campus! We look forward to seeing you all next year for the Campus Clean-up 2019.